Howard Johnson believes humans may someday be vaccinated against some forms of cancer in the same way they are now protected from diseases likes polio and influenza. Johnson is already developing such an approach. He has successfully immunized laboratory mice against melanoma, one of the most aggressive forms of skin cancer. Some immunized mice have survived for as long as 150 days after exposure to active melanoma cells, while unprotected mice died in a matter of weeks. 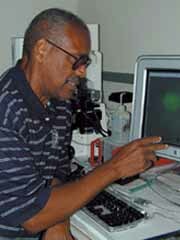 Johnson’s research focuses on superantigens and the role they play in activating cell responses. Superantigens are proteins that are strong stimulators of the immune system. Johnson uses superantigens to boost the response to a vaccine, in this case an injection of dead melanoma cancer cells. He believes superantigens may eventually result in preventive treatments for cancer and other diseases.